Remember those monsters you read about in scary stories or saw in movies? For all your fears, there was the rational voice that reminded you: they aren’t real. Well, for young Madison in “The Sandman,” the monster that frightens her the most — coming from a story read to her when she was even younger — can become very real and deadly. “The Sandman,” making its debut on SyFy on Saturday, Oct. 14, is a first-rate thriller written and directed by Peter Sullivan, a veteran of many television movies. He’s done his share of Christmas-themed movies, so “The Sandman” is a departure for him. Reportedly he has a passion for horror movies, and this movie proves he is a keen observer of what makes scary movies truly unsettling. The aforementioned Madison (Shae Smolik) is an 8-year-old girl who, as the movie begins, is traveling by car with her father, Colton (Jason-Shane Scott), and they appear to be on the lam. But soon it is revealed they are trying to stay a step ahead of something more horrifying and deadly. Soon Madison is orphaned and in a psychiatric ward, victimized by horrendous nightmares and surrounded by facility staff members skeptical of her claims that The Sandman is real and very lethal, energized by Madison herself whenever she gets scared. So the mix of a child being locked up and mourning her father presents the real potential for slaughter. 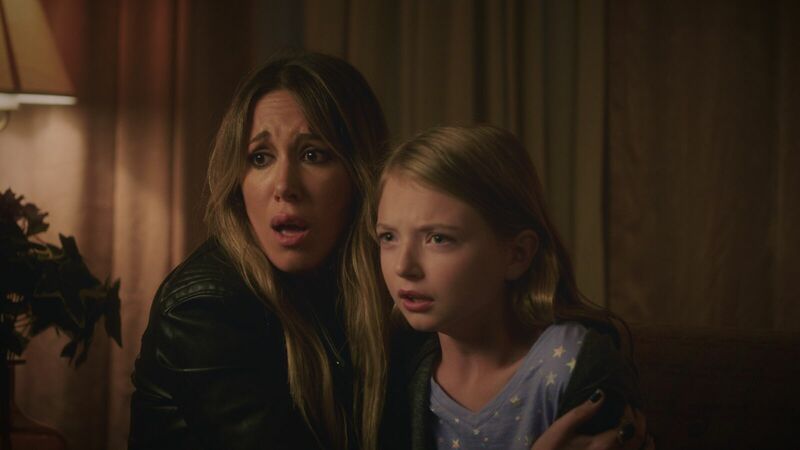 Madison’s only relative is her aunt Claire (Haylie Duff), a struggling artist with zero experience in parenting. Nevertheless, Claire is willing to take care of Madison while she butts heads with Dr. Cushing (Richard Gleason), who believes the girl must remain institutionalized, and Abigail Farmer (Lyn Alicia Henderson), a social worker not convinced Claire is capable of providing Madison with a stable home, especially with Claire’s “sometimes” boyfriend Wyatt (Shaun Sipos) hanging around. On top of this, Claire has been told by police that Colton was suspected of being a serial killer. Like all the other adults, Claire and Wyatt try to convince Madison that The Sandman is not real, but soon enough they witness, sometimes graphically, that the girl is not just imagining things. Meanwhile, lurking on the periphery is Valentine (Tobin Bell, old Jigsaw himself from “Saw”), attached to some shadowy organization that sees some possible sinister potential in harnessing whatever powers Madison possesses. The relationship between Madison and The Sandman (Mick Ignis) is ambiguous. While The Sandman seems to be protecting Madison, he also seems intent on destroying her. Seeking clues as to what was going on with Colton and Madison, Claire comes across a book in Colton’s car written by Dr. Amanda Elliott (Amanda Wyss, Tina from “A Nightmare on Elm Street”), a hypnotherapist. Claire deduces that Colton was intent on taking Madison to Dr. Elliott in hopes she could purge this monster from the girl. It takes a while and a lot of peril before Claire can get Madison to Dr. Elliott. It is under the guidance of Dr. Elliott that Madison is hypnotized in an effort to exorcise The Sandman. Bell and Wyss provide stellar support in “The Sandman” in what is a showcase for Smolik and Duff. Young Smolik excels in the role of Madison, mostly a sweet and innocent girl but one who can assume the deadly forces that have been seen before by Sissy Spacek in “Carrie” and Drew Barrymore in “Firestarter.” Duff adds depth to her portrayal of Claire, suddenly thrown into a situation that goes beyond just adjusting her lifestyle to assume custody of a young niece. Ultimately, this is a story of two people whose bond evolves from being strangers to one fortified by love and a determination to conquer evil. “The Sandman” airs initially at 9 p.m. Saturday on Syfy, with rebroadcasts at 3 p.m. Sunday, Oct. 15; 6 p.m. Monday, Oct. 23; midnight Tuesday, Oct. 24 and 8:30 a.m. Monday, Oct. 30. Amanda Wyss was in her early 20s and had worked mostly in television productions when she landed the role of Tina Gray in Wes Craven’s “A Nightmare on Elm Street.” Her brutal and bloody death at the hands (claws) of Freddy Krueger has become an iconic moment in the history of horror movies, and Wyss has gone on to a busy career in both television and movies. Although her role as Dr. Amanda Elliott in “The Sandman” entails only one scene, it is a pivotal one and Wyss was pleased to get the part. She admitted that portraying Dr. Elliott did present a challenge. Wyss said she enjoyed researching for the role, adding that a friend who is a hypnotherapist took her through a session. Indeed, Wyss conveys a doctor who knows what needs to be done. She has to be forceful with Madison when the girl is under hypnosis. With directives that prelude with “this is important,” Wyss’ Dr. Elliott is compassionate but adamant that the girl do what she is told. The actress, who recently turned in a bravura performance as a middle-aged woman living an isolated and repressed life with a verbally abusive father in “The ID,” also recently made a cameo appearance with David Naughton in “The Hatred” about four college women who spend a getaway weekend in a house that has a malevolent past and thus is a hotbed of paranormal activity. Wyss says that horror movies are “intrinsically sad,” which she believes is a key element in why so many of them develop loyal followings. She says that another vital aspect of scary movies — an underlying theme of the strength of family — can trigger an emotional tie between the movies and their viewers. Ultimately, she adds, “The Sandman” should connect with viewers because it is about family as Claire and Madison grow to love each other amid the dire situations. She praised the work of Duff and Smolik and how they formulated performances that made their relationship so believable. “Big Legend” is about Big Foot, and Wyss, who plays a skeptic in the movie, in real life is a fan of the Big Foot mysteries. Also in filming now is “Triggered,” which Wyss describes as a horror comedy. Later she will be on set for “Contention,” a horror western in which she plays a madame in a brothel. In a career that has been going since the early 1980s, Wyss remains enthusiastic. This is evident too in her willingness to make appearances at conventions like Texas Frightmare Weekend and Southern California’s semi-annual Monsterpalooza, as well as doing signings as part of promotions for movies. “I am so lucky,” Wyss concludes.